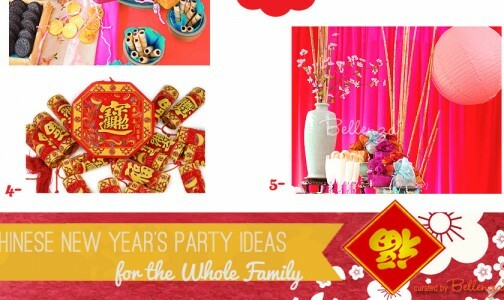 Decorating for this party can be a fun styling adventure. 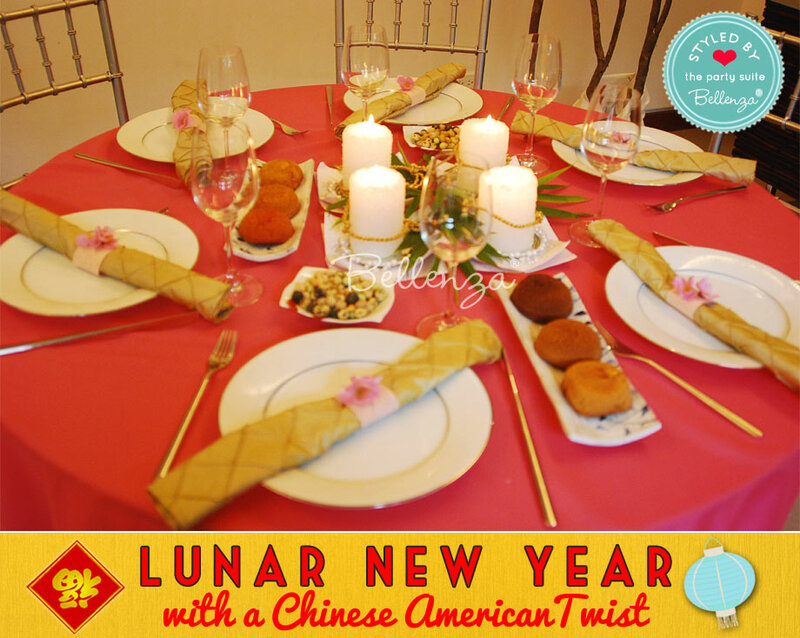 See the inspiration below for your guest tables, as well as for a Chinese-inspired snacks and sweets display. For your tablescapes, a solid red tablecloth immediately sets the Chinese air for your dinner. 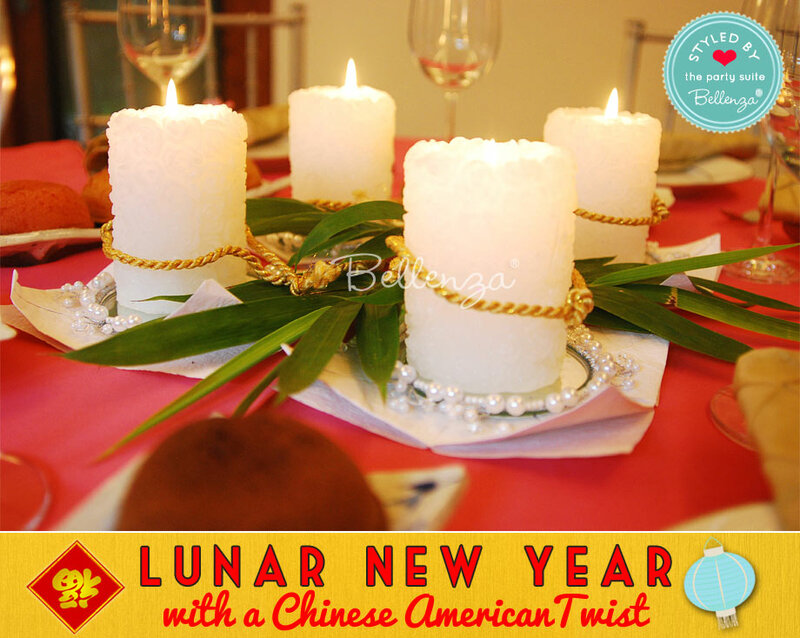 With classic white china and Western cutlery for the place settings, you can simply add Oriental touches such as napkin rolls reminiscent of bamboo, glazed ceramic condiment dishes and serving platters, and a unique candlescape centerpiece (described further below). Seen up close, the candlescape reveals simple yet stylish details: a grouping of elegant embossed pillar candles on pearl-ring mirror coasters, trimmed with cuttings of bamboo leaves (faux ones are available via Amazon). Serving as both welcome snacks for the guests and part of the table decor, too, are these mini Chinese cakes and crunchy nut mixes on ceramic blue and white trays and dishes. Bamboo steamer baskets (available via Amazon) would make charming themed containers, too. 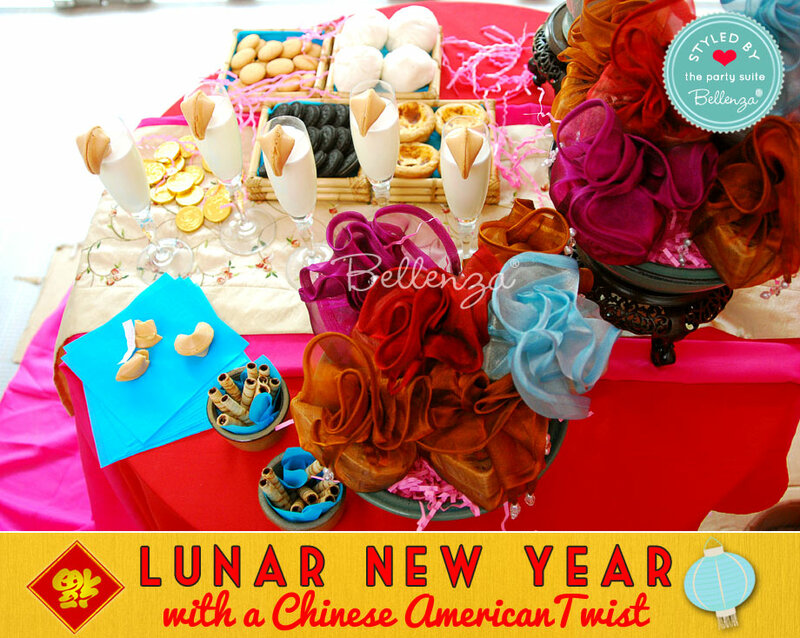 Finally, as a striking goodies table for the young ones at the party, pile a red-covered table with baskets full of Chinese snacks and desserts, earthenware bowls holding gold coins and wafer rolls, and glass flutes of cold milk with fortune cookies perched on their rims. 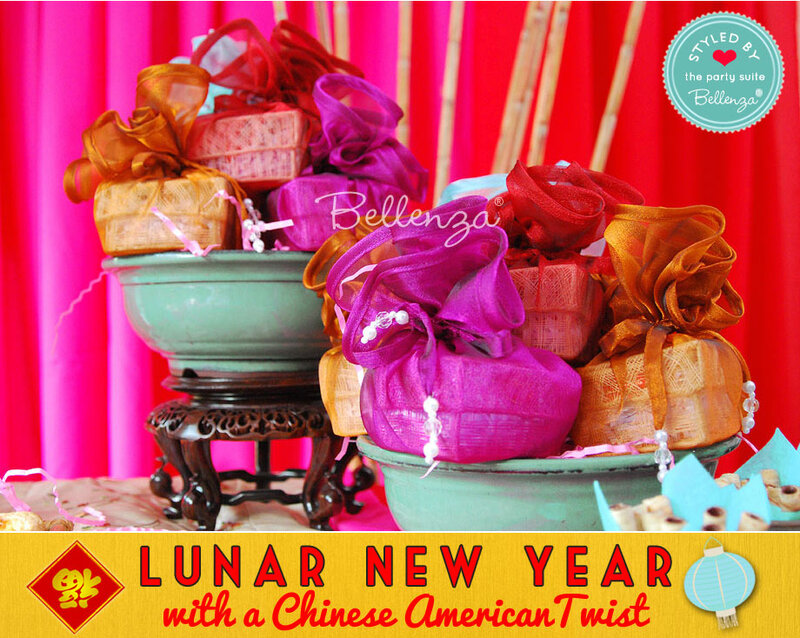 And for even more impact, display bundled up Chinese New Year party favors in large bowls on carved rosewood stands. No need to worry about the party menu either! 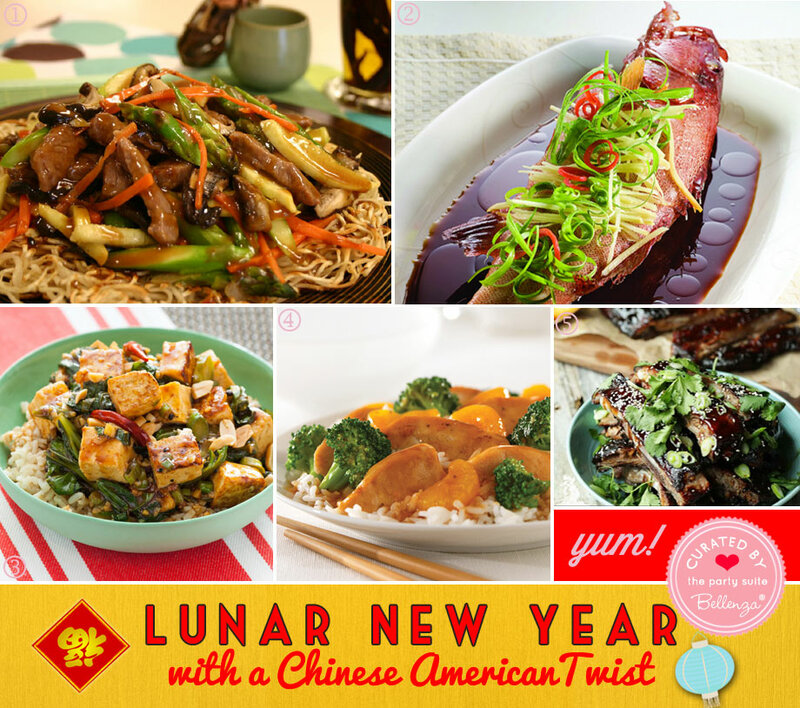 There are delectable Chinese dish recipes all over the web for you to choose from. These 5 we chose are easy to prepare and look absolutely delish! 2 – Steamed Fish in Double Fermented Soy Sauce – Also from Lee Kum Kee USA, this recipe is made with a whole fish seasoned with ginger inside its gills, then steamed on a bed of green onions, and served with a soy sauce and chicken bouillon mix poured over it. 3 – Kung Pao Tofu with Chinese Broccoli and Brown Rice – Want a no-meat dish? Blue Apron has this flavorful chili and vegetable stir-fry seasoned with peppercorns and aged rice vinegar, then served over hot brown rice and topped with chopped peanuts. 4 – Mandarin Chicken with Broccoli – An interesting flavor blend in this recipe from Ready Set Eat, made with sliced chicken breast fillets stir-fried with garlic, broccoli, and orange-ginger stir-fry sauce, then with mandarin orange sections added. 5 – Honey-Hoisin Grilled Spare Ribs – This hearty meat dish packed with flavor, courtesy of Ready Set Eat, features racks of ribs grilled while basting with a marinade of hoisin and soy sauces, honey, sherry, ketchup, and apple cider vinegar. Garnishings of green onions, cilantro, and sesame seeds are added just before serving. 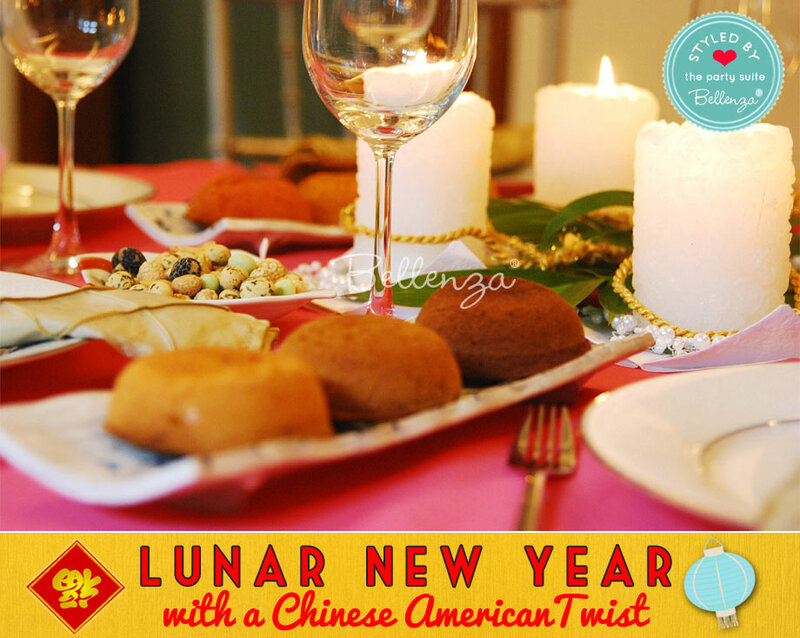 What a treat for guests to enjoy a sampling of well-loved Chinese sweets and desserts to mark this cross-cultural Lunar New Year! 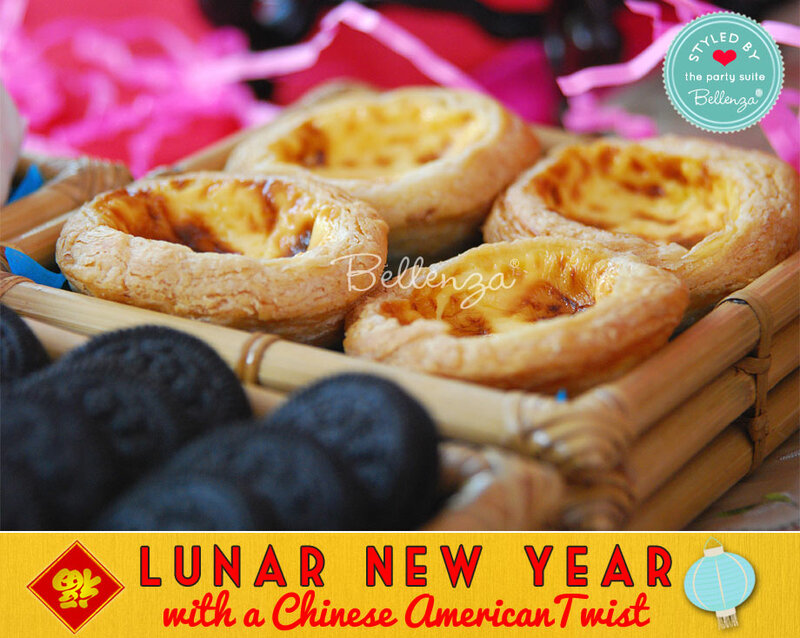 Custard tarts are a yummy staple at any Chinese gathering. You may look for a recipe online to bake your own, or simply buy them from a nearby Asian bakery. 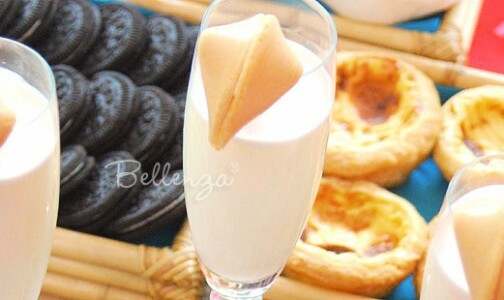 Display the tarts (and your fave Western goodies, like Oreo’s!) in quaint bamboo containers to match the theme. 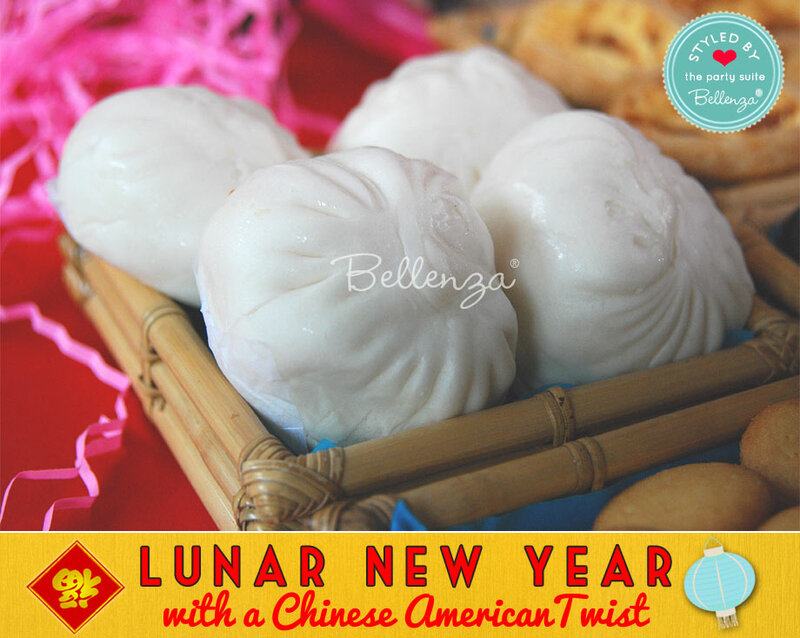 Another huge favorite are steamed buns stuffed with a sweet-savory saucy pork filling. So are almond cookies (see recipe below), as well as Chinese dried plums, sesame seed balls, and of course fortune cookies! 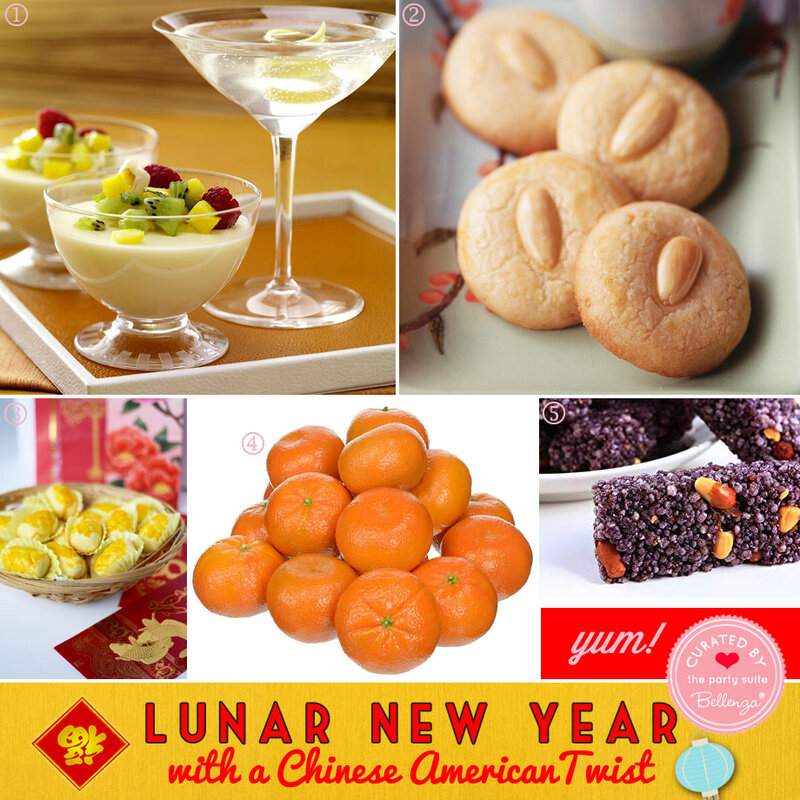 Here are additional dessert ideas that ingeniously combine Asian and Western flavors and ingredients. Take your pick! 1 – Lemongrass Panna Cotta with Tropical Lychee Salsa – This recipe from McCormick is a cool, refreshing gelatin dessert flavored with lemongrass and topped with a mix of lychees, fresh mango, kiwi, toasted coconut flakes, and chopped mint. 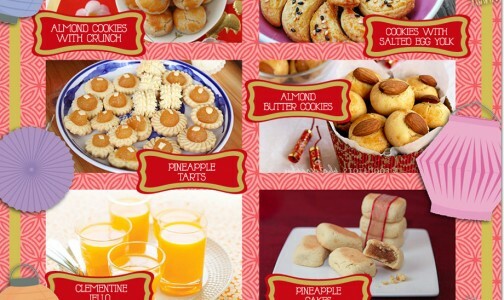 3 – Pineapple Tarts – These tarts are a staple in Chinese bakeries during the Lunar Year celebration. They are made with a chewy filling of caramelized pineapple wrapped in buttery pastry, then baked till golden. “Pineapple” in Hokkien literally means the “coming of fortune,” so this sweet treat is thought to bring prosperity and luck to those who eat them. 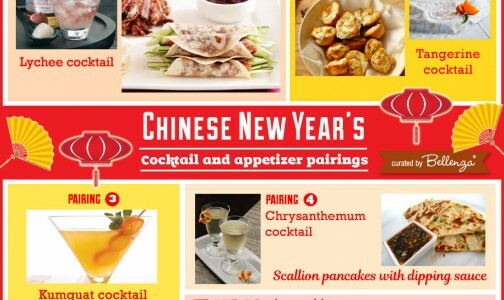 This idea comes from Michelin’s guide to Hong Kong. 4 - Clementine Mandarins – Another auspicious edible during the New Year due to their round shape and golden color, these mini Mandarin oranges are said to symbolize wealth and good fortune. Buy them at an Asian market or via Amazon. 5 - Helen Ou@ Huang Lao Wu Rice Crispy Snacks - These crunchy snacks made with peanuts, malt syrup, and sesame seeds are available ready to serve via Amazon. 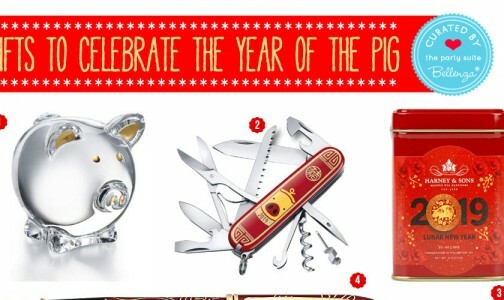 For party favors and gifts, there are those themed for a specific Lunar Calendar year (see our favor picks for the Year of the Pig) this 2019. 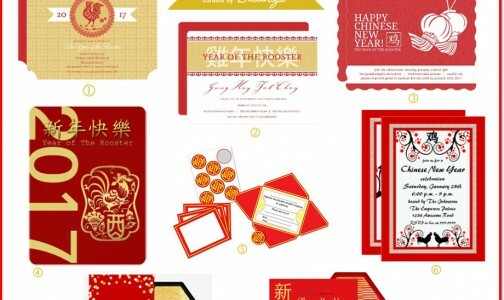 Or you may choose those that mark Chinese New Year in general and wish good fortune to all! 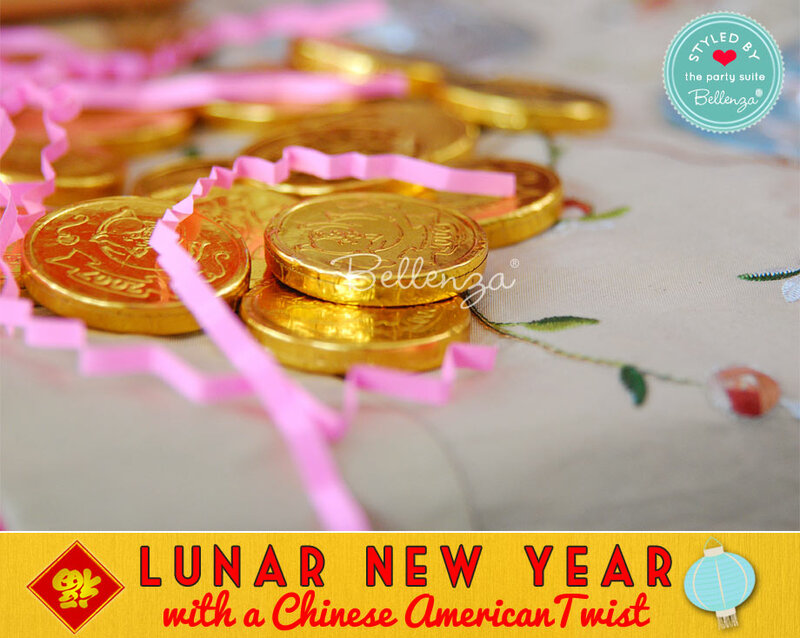 Gold-wrapped chocolate coins clearly extend wishes of prosperity and abundance. Luckily, these are readily available in supermarkets or via Amazon. So just bundle them up for giving! 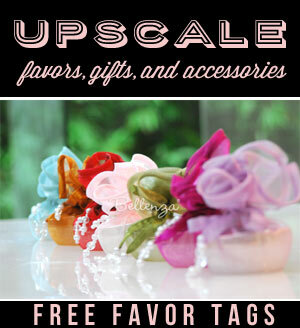 Remember the overflowing bowls of favor bundles shown earlier? Here they are up close. Heart-shaped woven boxes filled with Chinese sweets or perhaps packets of herbal tea, finished with organza wraps in vibrant red, fuchsia, and orange! 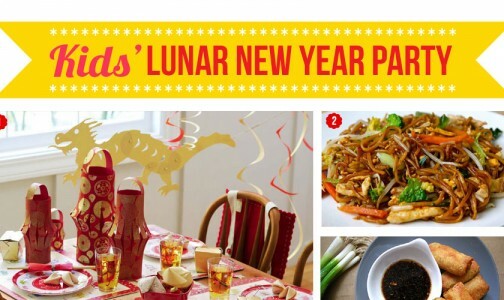 You could also choose a selection of wines, and dress them up for the occasion in Chinese New Year Bottle Labels – available from Amazon. As they say in Mandarin Chinese, “Gong Xi Fa Cai” or in Cantonese, ” Kung Hei Fat Choi,” everyone!